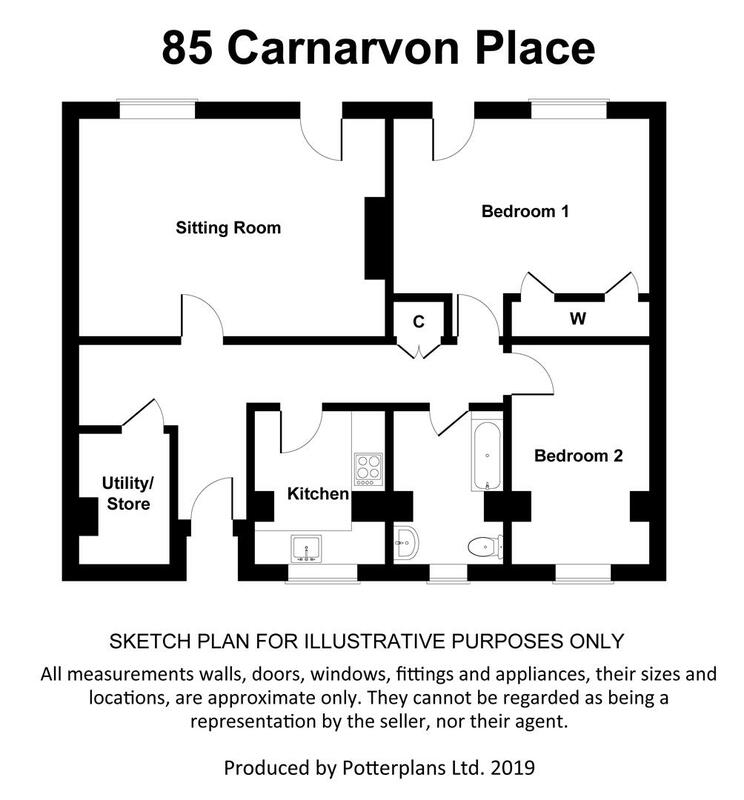 An excellent opportunity to acquire a well proportioned ground floor flat which offers a considerable level of internal accommodation lying in the region of 900 sq ft and comprises initial entrance hall with walk-in store/utility off, sitting/dining room, kitchen, two double bedrooms and bathroom. The property requires a programme of modernisation and refurbishment and would be an excellent blank canvas for those looking to place their own mark on what is a relatively affordable home within this highly regarded market town. The property occupies a convenient location within walking distance of the heart of the town and its wealth of amenities as well as local bus routes. The complex is situated within communal gardens to the front and rear with on-street parking within the vicinity. The property is offered to the market with no upward chain and viewing is highly recommended to appreciate the potential on offer. The market town of Bingham is well equipped with amenities including a range of shops, primary and secondary schools, doctors and dentists, leisure centre and railway station with links to Nottingham and Grantham. The town is conveniently located for commuting situated at the intersection of the A52 and A46 and with good road links to the A1 and M1. Cloaks Cupboard / Pantry - 3.53m x 1.22m (11'7 x 4'0) - A large walk-in storage area which could provide utility space, having power, ceiling light point and window to the side. Sitting Room - 4.57m x 3.89m (15'0 x 12'9) - A well proportioned reception benefitting from a southerly aspect to the rear, chimney breast with gas fire point and shelved alcoves to the side, central heating radiator and window to the rear. Kitchen - 3.66m x 2.03m (12'0 x 6'8) - Requiring modernisation but fitted with a range of wall and base units, rolled edge work surfaces with stainless steel sink and drainer unit, space for gas or electric cooker, plumbing for washing machine, central heating radiator and window to the front. Bedroom 1 - 3.12m x 4.57m (10'3 x 15'0) - A well proportioned double bedroom having aspect to the rear, two built in storage cupboards, central heating radiator, glazed single door leading into the rear garden. Bedroom 2 - 4.72m x 2.46m (15'6 x 8'1) - A further double bedroom having aspect to the front, central heating radiator. Bathroom - 3.71m x 2.06m (12'2 x 6'9) - Again requiring modernisation but having a suite comprising panelled bath, low flush wc, pedestal wash basin, central heating radiator and UPVC double glazed window to the front. Exterior - The property occupies the ground floor within this three storey block of flats, having communal gardens to the front and rear, with south facing rear aspect and doors leading off the main bedroom and sitting room. The property does not have its own specific parking but there is generally ample on-street parking within the vicinity. Council Tax Band - Rushcliffe Borough Council - Tax Band A.